8.33 points at 24 votes (rank 40). 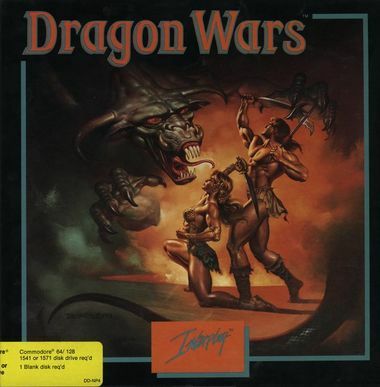 The role play Dragon Wars was released in 1989 as the follower of the The Bard's Tale-trilogy (BT) for all common home computers and uses its game mechanics and system, but with new character types, monsters and the like. 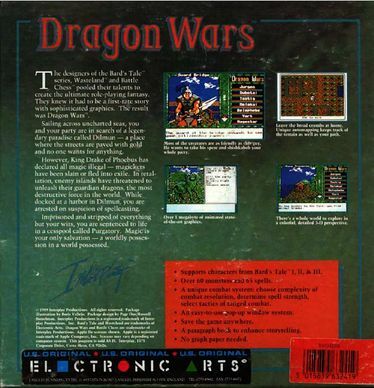 Dragon Wars was developed by Interplay's core team (Producer & Co.-designer Brian Fargo, programmer Bill Heineman, graphic artist Todd J. Camasta, musician Kurt Heiden) and the freelance game designer Paul O'Connor and in contrast to the BT role plays marketed by Interplay themselbes instead of Electronic Arts. Same as with Interplay's Wasteland, Dragon Wars sources out the big part of the in-game texts into an external booklet; the game regularly refers to its paragraphs. The story takes place on the fantasy world Oceana, which circles the star Sirius. After a long search through endless and dangerous oceans for the legendary continent Dilumn, where gold and treasures so to speak "can be found on the streets" and where according to lore life costs nothing, you and your team finally find it and sail into a shore. However, King Phobos has declared all magic illegal there. All persons who were suspected to have the power for this skill were killed or they escaped to the exile. As repayment they threatened to set free the warden dragons, the most dangerous creatures of this world. Also you and your party are captured and brought to a prison town where greed and violence rule. With nothing except for your little magical skills you first have to make sure you survive. The journey through the continent Dilmun starts for your party with four characters (later up to three characters can be added) in the run-down city Purgatory. You realize quickly, that someone named Namtar is planning to conquer the whole planet. So you steer your party through the town - get some new weapons and magic spells before you can think about escaping from Purgatory, exploring the rest of the continent, solving the numerous puzzles and finally defeating Namtar forever. This role play abstains from certain character races and classes. When creating a new character you can allocate 50 character points arbitrarily to different skills and talents (e.g. different magic types, handling weapons, picking locks etc.) and five character attributes (Power, Intelligence, Dexterity, Spirit and Health). But you can also take over characters from the Bard's Tale series. When the characters go up one level, they each get two character points added, which can be allocated arbitratily. There are over 60 magic spells in four different classes available, which have to be learned with the help of scrolls, though. The graphics are kept in the style of "Bard's Tale" in 3D, the attackers are shown in animated graphics. During fights with monsters you can decide for refined tactics for the fighters such as "Normal Attack", "Risky Blow" or "Disarm Enemy". When casting some of the magic spells, you can decide how many spell points should be used (the more spell points the higher the effect of the spell). With the built-in "auto mapping" you do not need to draw maps. By pressing a key, the map of the region where the party currently stands, is called up. The manual with its 147 text paragraphs offers a lot to read. If certain points in the game have been reached, you get the prompt to read the corresponding paragraph. In contrast to the "The Bard’s Tale" or the AD&D series, the dungeons do not have to be "checked" one after the other, but the towns and places need to be visited several times, to solve a great number of tasks. So if the abilities of the party are not enough at one place, it might be the case, that an item, a magic spell or another finished task are missing. The places where the party cannot proceed should best be noted down. This overview will help to uncover the mystery later. You need to make a copy of disk side 1. It might be better to also make a copy of the other original disks. You can do this with any copy program or with the programme on the game disk in the utilities section (can be reached by pressing the key "U" in the title screen). The disks are changed during the game, the status is saved on side 1. The original has no copy protection on the disk, for this words are asked from the manual. Through the use of hints to "paragraphs" of the manual in the game, it is as reasonable to play without an original manual as is a book cover without a book. The original manual (pdf) can be found on C64-Games.de. The menu items in the menus are basically chosen by pressing the first letter (number) of the menu item. You can leave a menu by pressing "space" or "left arrow"
The duration of the display of the texts during a fight can be adjusted with the cursor keys. C = CAST SPELL. You need to state who should cast the spell, what magic class should be used, what type of spell it is (Combat, Heal or Miscellaneous) and finally which name the spell has. If the spell allows it, you can also enter the number of "Spell-Points" that you want to use for this spell. After that you are informed if the spell has been successful or if it has failed. D = DISMISS CHARACTER. If you want to remove any character (no matter if player or NPC), choose this command. But caution! After using this command the character is removed with all items, spells and abilities! O = ORDER. You'd best give the characters with the best AV, DV and AC the first four places, as only characters on these places can hit enemies with their weapons. Magic and firearms can also place hits from the three last places. P = PICTURES ON/OFF. Switches on or off the images during a fight. The fight runs faster without images and preserves the disks. Q = QUIT GAME. The score is NOT automatically saved! S = SAVE GAME. You can only save one status! U = USE ITEM, SKILL, ATTRIBUTE. With this multifunctional command you can use an item, skill or attribute. First enter the number of the character, then "I", "S" or "A". After pressing "S" you are asked, if it is a "Lore-Skill", a "Knowledge-Skill" (incl. Magic and Bureaucracy) or an "Ability-Skill" (most of the other skills). Finally you can choose the aim. E.g. if you choose a "Bandage-Skill", you are asked, which character you want to bandage. If you find a "Spell-Scroll", you should use the "USE" command to read it. If you have the corresponding magic skill, you will learn the spell for ever. X = EXPERIENCE SCREEN. This command shows the screen which is also used, when creating a new character. Here you can allocate recently earned character points.
? = AUTOMAP. The shown section can be moved with the keys "I", "J", "K", "L". Black areas show the region that you have not explored yet. Skills represent the abilities of a character. The right choice and use is inevitable to solve the adventure part of Dragon Wars and with this solve the game. Skills are defined in type and level and not every skill must be higher than 1 to be useful. Level 1 is most of the time enough for "Lore-Skills", level 2-3 should be reached for skills in Lockpick, Bandage, Climb and the weapon and magic skills. Skills always start at level 1 and can be raised by experience points. It is not necessary that every character has all abilities, it is even better that some of them get skilled as specialists. In some cases it is enough to own a skill to have an advantage of it. As an example one could name the "Lore-Skills" (knowledge through lores), which give out information at the right time (if the right level of Lore-Skills is available). If a character of your party suddenly notices a peculiarity without having used the "USE" command, a "Lore-Skill" is the cause. Other skills need to be used to work effectively. If you are confronted with a puzzle, of which you believe that it can be solved with the help of a skill, choose the skill and just try. It can also be that you only need a better education for this skill. Namtar, the mightiest magician in Dilmun could manipulate King Drake so that he imposed a general ban on magic, which gave Namtar a monopoly in this area. The City States of Dilmun did not react benevolent on the ban and war broke out. Numerous magicians were annihilated in the first weeks of the war, while conventional troops pushed forward the fight until these days. Namtar's raiding patrols, a kind of magical secret police, eliminated most of the top magicians before an effective resistance could be organised. Namtar had not won the war, the teachings of magic are proscribed in Dilmun, but rumors say, that magic is taught at secret places and it is one of your tasks to restore the lost knowledge about magic. The most respectable master of High Magic was Lanac'toor, a dangerous instable creature, which at that time lingered in the "City of the Yellow Mud Toad". Lanac'toor was the first aim of the raiding patrols and was ambushed. His body was turned to stone and broken into pieces. With Lanac'toor also the performing of High Magic disappeared, but rumors say, that Lanac'toor himself had a teacher who can be found somewhere in the Eastern Isles. Oddly enough, the "Sun Magic" stayed public and legal. The master of Sun Magic is Mystalvision, a very well-known hero who can be found in the "Temple of the Sun" in Phoebus. Sun Magic got popular as the sun Sirius made the polar ice caps melt. 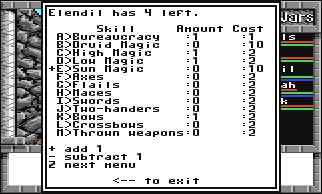 Sun Magic combat spells are the most powerful ones in the game. "Druid Magic" is based on the understanding of elements and creatures and is therefore the purest of all magic but far away from the power of High Magic. The most skilled druid is "Zaton the Displaced" of whose whereabouts nothing is known. The cult of Druid Magic was driven into the undergrounds by Namtar’s prosecution, but the worship of the godhood of the cult, the Beast-Man Enkidu, is continued at the different druid shrines. There is a further class of magic in Dragon Wars, named "Miscellaneous Magic". These three spells can be used by every character who has a skill in any of the four standard classes of magic. When you cast a spell, the computer always subtracts a certain number of power points from the caster of the spell. In some cases you are asked to give the number of points you want to invest in this spell. These extra points then raise the duration of the spell, the damage it does or its effectivity in this case. The number of points that you can invest in such a spell is limited by the skill level x2 that you own in this magic class. In the list of spells you find a more detailed description of all known spells. Although some of them are documented very exactly, there are others with incomplete description. Magicians can possibly endanger themselves, if they play with powers that they don't know. Anyway, don't hesitate to experiment with them, as only if you know your spells right, you will be able to solve the game. The numbers next to the places refer to the corresponding map. The map of Purgatory is here. In the lower southeastern tower there is a pool that generates spell points (1). So before you use Dragon-Stones (which show the same effect), you'd better use the pool. Humbaba (2) is in the northeast, when you have defeated him, you go to Clopin Trouillefou (9) 5N5E away from the SW corner, (if he asks, don't say that you are a tramp), there you will get an award. A secret door leading from the inner city into the aisle in the outer walls is in the northwest (11), a second secret door leading from the inner city into the aisle in the outer walls can be found in the east (12). A secret door from the aisle in the outer wall to out-of-doors is in the corner in the southwest (14). Irkalla is in the west, here you get through the Apsu-Waters (10) into the Magan-Underworld. An arena (7) where you can get the first armour and where there are also the Citizenship-Papers (you get them after you've won the fight), can be found in the north. A magic shop is in the west (13), you can get scrolls there for free and sell them again at the black market (6) (west of the arena). The inn (4), where Ulrik is, who joins the party, is southeastern from the black market. A healer (3) is in the northeast, but it is better to heal yourself with "Bandage". A slave market (5) can be found south of the arena, from there you are taken into a mine, from which you can escape. The main exit (8) from the city center is between the two southeastern towers, but is heavily guarded. Lansk (4) is in direction of north, a source to reload the spell points (b) is a bit western. 2x south, then west or east, there is a treasure (d). But you should keep it there for the end fight against Namtar, as it contains Dragon Stones. You should avoid every fight (run away). The only, not random fight is the one against the Guard of the Treasure. 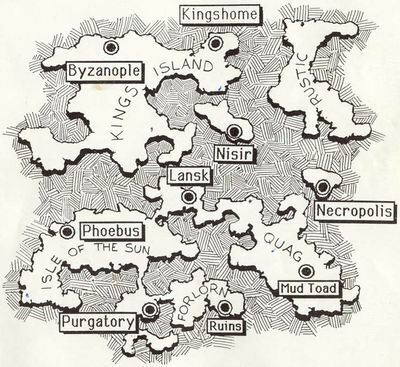 Kings Isle with the locations: Old Dock, Dwarf Ruins and Dwarf Clan Hall, the Bridge of Exiles, Snake Pit, Siege Camp, Byzanople and Dungeon, Kingshome and Dungeon, Pilgrim Dock, Salvation, Nisir (reachable from Salvation and the Magan Underworld). You have two ways (overworld, underworld) to get to Salvation (where the end fight takes place), and both have their perfidities. On the way through the underworld you need to cross a bridge, where fairylike creatures claim 75% of the party's energy and on the way through the overworld you need to take the detour over Kings Isle, for which you need to get a pilgrim robe for the passage to Salvation (in Kingshome). Beware of Metalvision. He is a helper of Namtar, that is why Sun Magic was not prohibited. You should take a look around in Irkahallas Realm, in the northwest of Magan Underworld. If you enter the pit to the left of the entrance at the border to the water, every character gets a nice bonus, that can be added to the skills. Your party can find places to reload their energy in both the over- and the underworld. In the Magan Underworld in the southwest between the fires you find a chest with the sword "Slicer", which makes life very much easier. But beware! Although you get into the Magan Underworld from the starting town Purgatory, you should not be too weak, before you go there. In the Underworld of Necropolis dead characters can be revived. Although it can be seen in the "Magan Underworld", it cannot be entered from there and so you have to put up with the cumbersome travel on the upper world over the "Smuggler's Cove". And a tip for the former Bard's Tale fans (hello The Ryk ;)). Take over a Destiny Knight with as many hit points as possible (recommended 500-600), also from B.T.II. With this chasing monsters in Dragon Wars gets a pleasure. However, you still have to be careful. The former Destiny Knight is not immortal any more, but the hit points should be enough for the time being. In the .zip-file of the game on C64-Games.de and Gamebase64 you find on an extra disk files with the manual including paragraphs, tips and a character editor. The version "Dragon_Wars_(None)_Side_1.d64" to "Dragon_Wars_(None)_Side_5.d64" (original disk) from C64-Games.de was played through (about 99% of the sidequests solved) and there were no mistakes recognized until now (see also "Emulator settings - NTSC"). The version by "Legend" gets instable when fighting against the rats (faulty images and pixle faults) and can (will with 90% chance) crash at the next fight (blue screen)! For more details see "Walkthrough - A visit to Magan Underworld and Phoebus ". The currently available versions all need the settings "NTSC" in the emulator. They can also be played with "PAL" setting (and the saving of the game status seems to work), but very unlovely flashes and colour gradiants appear in the animated fight images!! The German version of this article on "www.C64-Wiki.de" was "article of the month" in December 2009 and "article of the year" 2009. This page was last modified on 7 April 2015, at 14:02.